To describe this region, it is necessary to start in "the celestial mountains" (called the Tien-Shan Mountains in Chinese). This mountain system is located in Central Asia, mainly in Kyrgyzstan (the western part) and China (the eastern part), partially also in Kazakhstan and Uzbekistan. Its length is about 2500 km from the West to East, and 300 km from North to South. The highest points are: Pobeda Peak (7439 ffl) and Khan Tengri (7010 m). 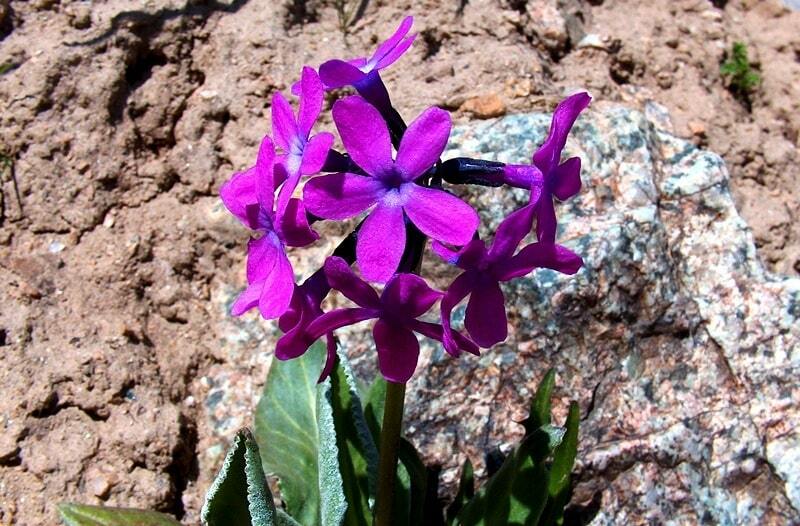 The Central Tien-Shan, the Northern Tien-Shan, the Western Tien-Shan and the Interior Tien-Shan are identified by natural peculiarities. Landscapes of an Alpine type are characteristic of the Northern Tien-Shan: the steep ridges are underlined by turquoise-grey glaciers and bright snow plains; the multi-coloured Alpine meadows adjoin the dark coniferous forests of the Tien-Shan firs. High-alpine tourism is mainly developed in the Northern Tien-Shan, among whose foothills, aquatic, ski and bicycle tourism are also popular. The slopes vary: rocky, snow-glacial and combined. The slopes are accessible all-the-year-round, but the optimal period is June to August. Each tourist can stay overnight, to drink "kumys", a national drink and to see the traditional everyday activities of the Kazakh people in such settlements as; Kegen, Naryhkol, Zhalanash, Chundzha and Kolzhat. 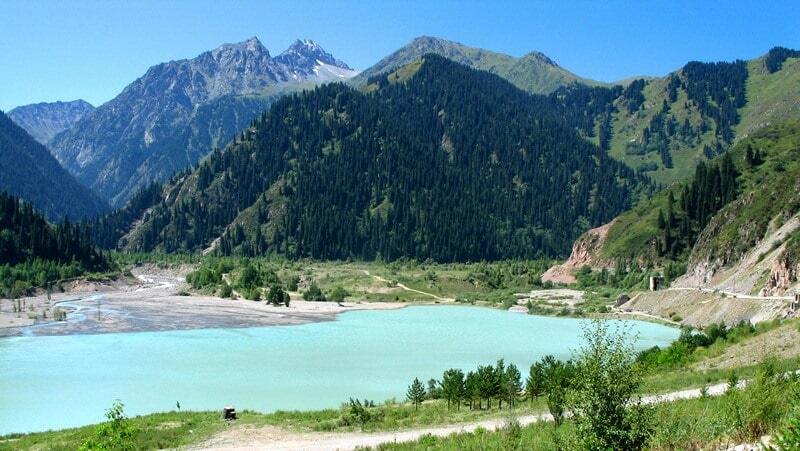 About 10 hiking tracks have been developed through the Northern Tien-Shan. Safety for the tracks and the mountain climbing slopes are provided by the emergency, tourist and mountain climbing services. The fast flowing mountain streams provide many dangerous and difficult obstacles (rapids, over-rolls, clamping and so on). One can use a range of boats on the Charyn and Chilik Rivers and their tributaries, but white waters are only accessible in rafts and inflatable craft. 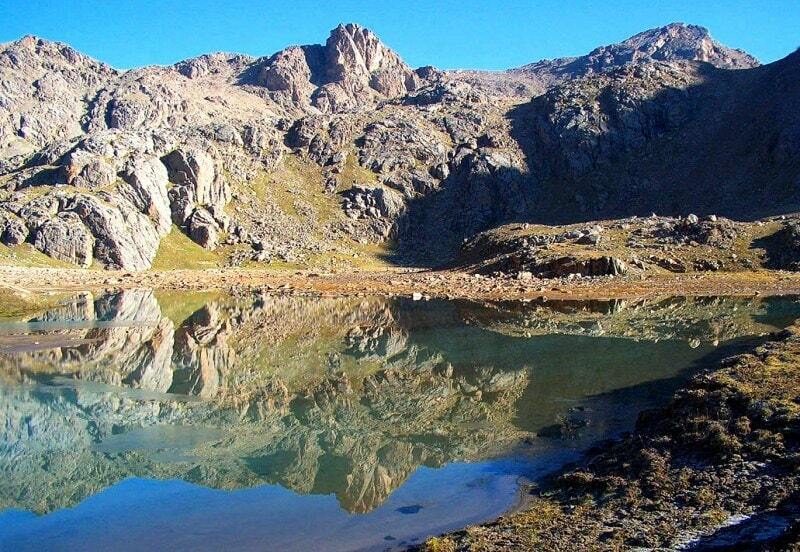 The beauty of nature, rocks, canyons, mountain streams and reserves and their inhabitants is the appeal of this region. 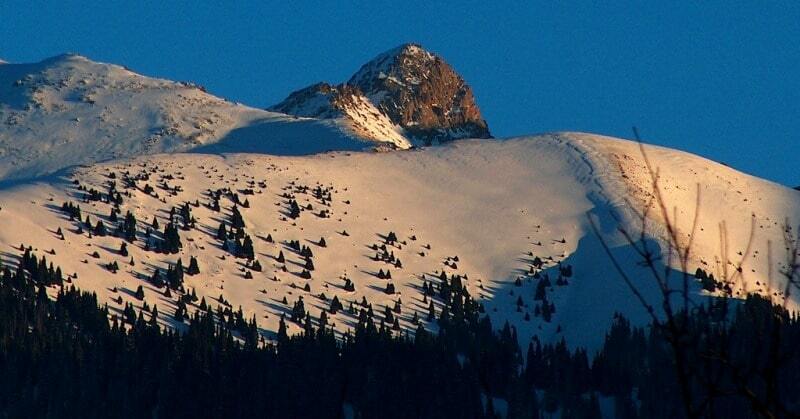 The Zailiyskiy Ala-Tau range lies in the northeastern sector of the Tien Shan mountain system. It is the southern backdrop of the verdant capital of Kazakhstan, Almaty, whose name means "mother of apples." Though only forty kilometers from the city, like most of the Tien-Shan mountains this range is also relatively isolated and quite undeveloped; next to zones with sporting facilities, such as the Medeo stadium, there arc valleys such as Big Almay and Aksay with peaks that still have not been climbed. The natural setting here is unspoiled and quite lovely. The meadows are filled with irises and wild tulips, and many rare animals such as snow leopards, wolves, mountain lynxes and golden eagles live in the mountains. he Smal Almy valley, on the other hand, is more frequented, especially by skiers, who frequent the Chimbulak ski resort which provides ski lifts that go up to 3,200 m. This valley, which can be reached easily from Almaty, leads to the Tuyuk-Su (4,218 m), Pogrebetskogo (4,219 m), Molodiozhnaya (4,147 m) and Komsomola (4,376 m) peaks. Here there are routes, which can also be done on skis, with lovely panoramic views; their starting point is the well organised Molodiozhnaya meteorological station at 3,438 meters above sea level. 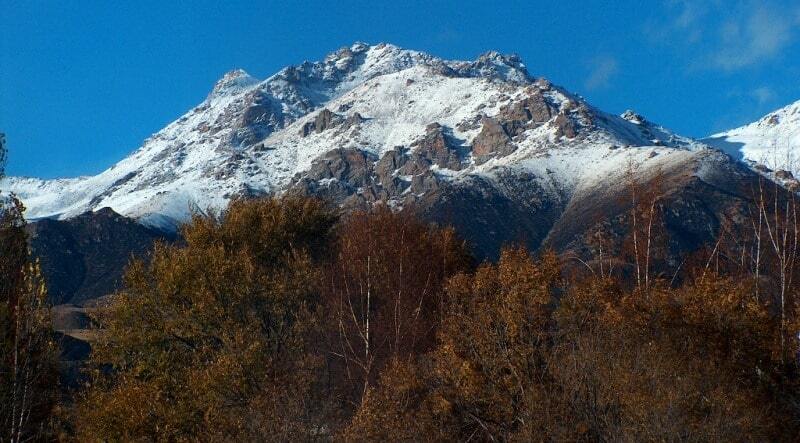 The climb up Talgar, the tallest peak in the region (4,973 m), which lies northeast, is more difficult. The base of this mountain can be reached by helicopter or via a practicable road and a twelve-kilometre walk. South of Zailiyskiy Ala-Tau is the huge Issyk Kul Lake, which can be gained by crossing the rather easy passes in the Zailiyskiy and Kungey Ala-Tau ranges.